Rebecca Rebouché is a Louisiana-based artist who makes allegorical paintings of the natural world and is best known for her exclusive collaborations with Anthropologie. Learn more at rebeccarebouche.com. 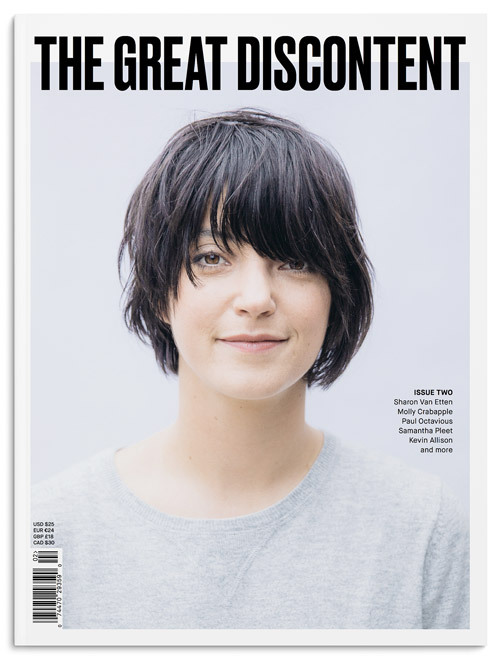 Editor’s note: This is a print-first feature, originally published in The Great Discontent, Issue Two. Pick up the print magazine in our online shop. You make your home in your native Louisiana, but you travel often. How do home and your travels influence your work? I used to think that I was mainly influenced by my Southern Louisiana roots. Elements of life in the South were a large part of my early work, and I really found my voice after returning home to New Orleans following Hurricane Katrina. However, the more I’ve traveled to the far reaches of the globe, the more I’ve found that I can be influenced by a great many places. I have a theory that we are always triangulating ourselves against three points, one of those being home or our sense of home. Sometimes another person can feel like home to us; as we travel, we often compare the sights and experiences to how they are like or different from home. And yet, if we travel long enough, sometimes the home point on the triangle is replaced with something or someone else, which feels like floating into an endless universe of possibilities. I love the way we operate to find out who we are in the world. That general search for who we are and what feels like a point in the triangle is what much of my work is about. Are you creatively satisfied? I’m always creatively satisfied—if I have any dissatisfaction, it’s in other more practical arenas. Creativity is the language I speak. I constantly research concepts I’m interested in, and I always collect reference imagery and catalog moments worth expressing. There’s an overarching creativity that stretches from my paintings to my home to how I present myself online and at events I plan to showcase my art. All of that vibrates with a passion that can only come from being really into something in a big way. I think being creatively satisfied means that you possess the faith that as you connect the dots of your inspiration, bridges will form—and yet more dots will appear. Once you settle into the idea that that can continue forever, then you are satisfied knowing that there will always be something that draws you in, compels you, and drives you to look closer. There will always be another way to express yourself. It’s a dance that never ends. The theme of this issue is hustle—any thoughts on that? Oh, I have many thoughts on hustle—don’t get me started. Hustle is the dark horse of creativity, the close cousin of Grit and Tenacity. Without the hustle, drive, and complete devotion to making things happen, you are average. And I don’t mean hustle as in a nasty, shallow, step on anyone on your way to the top. No, not at all. I mean the unwillingness to make excuses about why you can’t achieve your dreams. I have this saying: “There’s no music playing when your dreams are coming true.” That is the hustle. The hustle is humbling and, at best, completely authentic and gracious. Everyone sees me at the gallery opening, but no one sees me changing my clothes in my car. I could almost cry thinking about all the ways I’ve hustled, sacrificed, and scorched the earth with my striving. But what you start to realize is that hustle isn’t just for the novices and underdogs—hustle is a mindset, a practice. These days when I work really hard, I go for a run in the evenings to combat stress. As I run, I repeat to myself, “I refuse to fail. I refuse to fail. I refuse to fail.” Maybe that sounds simple, or even negative, but it’s edgy enough to strengthen my tenacity, to help me visualize my goals in relationship to my true north, and to cultivate enough energy to make those goals real.